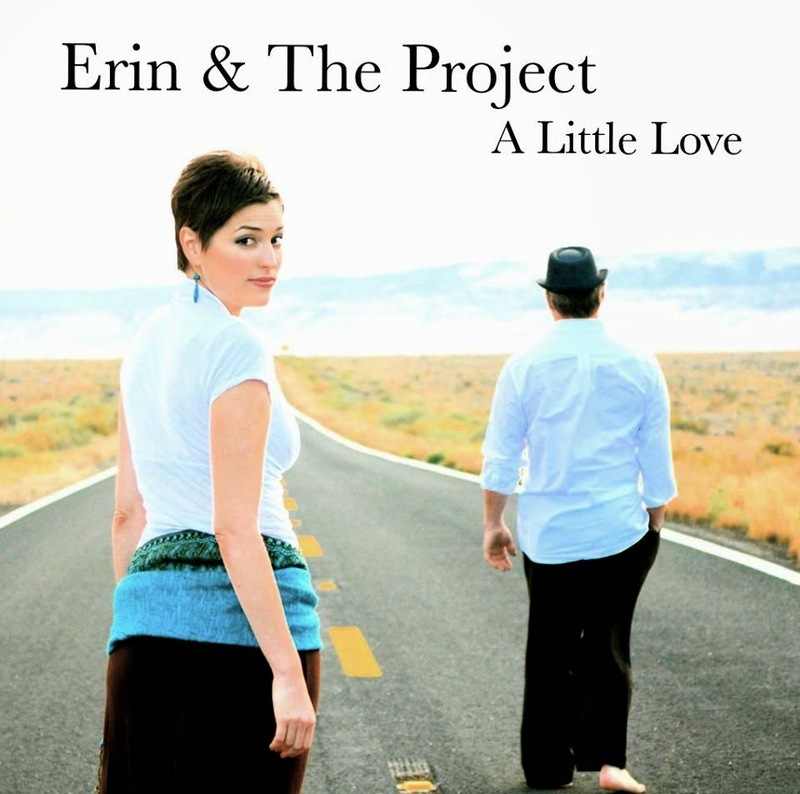 A Little Love, the soulful new release from Erin and the Project has hit the airwaves for anyone to tune in and listen. Jazz inflected, funky expressions from the diary of life, lived and loved, the pain and the joy made known by passionately sung poetry in motion and upheaval. Blues and rhythms containing crucial statements about the depth of human experience in different situations. 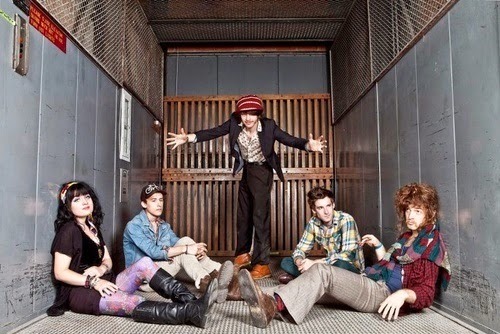 Seems obvious from their album cover that Erin & The Project are here to go. This time core Project members Erin and Paul Ezekiel are joined by guitarists Eric McFadden and Matt Heulitt, Jason Langly on bass, Phil Bennett on organ, and Ram Kaundinya playing tablas. This group has some serious funk credentials. Matt Heulitt is currently a member of Zigaboo Modaliste's band and has played with Taj Mahal, Sting, Santana, and Mickey Hart among others. McFadden recently toured with Eric Burdon and the Animals. He was in George Clinton's Parliament/Funkadelic for 3 years and has also recorded with Fishbone, Reverend Horton Heat, and Joe Strummer to list just a few. Jason Langley has toured with Elvin Bishop, Shemekia Copeland and played with B.B. King and Coco Montoya. He also toured with the Broadway National Tour of the musical DREAMGIRLS. The first single, Promises, was mixed by Tchad Blake who not so long ago won an engineering Grammy for his work with the Black Keys. A Little Love was recorded at Prairie Sun, Cotati, CA by yours truly. I mixed the other songs and mastered it at Ancient Wave in Nevada City, CA. Our latest album, Keme Borama is now available for purchase online. Buy it digitally at Itunes or the physical copy here. The album highlights one of the golden voices of Griot singing from Mali - Tiécoro Sissoko. Tiécoro is an exceptional solo artist and an intricate guitar player with a true Djeli soulful voice. He performed every week with the multi GRAMMY award winning kora player Toumani Diabaté at the famous Bamako club ‘The Diplomat’. Throughout his career, Tiécoro toured West Africa and France and played weddings, ceremonies and concerts in Bamako up until the last days of his life. This album is Tiécoro’s only recording to be published and it’s a testament of his role as a Griot and a protector of his lineage. Despite the attempt to ban music, Griots and other Malian musicians continue to produce some of the world’s greatest music and Tiécoro’s final recording is a shinning example of storytelling through music. on the bones of the old"
This is jazz poetry, poetry about jazz as jazz returning to the be-bop beauty of the beats; the lifestyle,the transcendence delivered with swing jazz syncopated rhythms in the flavor of "Bird and Monk and Dizzy" who appear the guardian spirits of this document. Words and vocals by John Sinclair, ex-manager of the MC5, famous '60's political prisoner, and leader of the White Panthers. Music by Steve Fly, dj, musician, literary collage artist, futurist philosopher, etc. You can listen to Mohawk here. Make sure to listen to the hidden track at the end of California Moon to hear a classic historical recording. Dreams Get You Nowhere or Dreams Get You No Where, either or both, is the new release by Jack and the Bear the recording of which I wrote about here. I'm very happy with the way this one turned out, with the way it sounds. The music and songs hold up as classic American roots based compositions, passionately sung and performed; food for thought and for unthought; rousing melodies, anthemic at times, sparking some kind of revolution, what can I say ... listen to it here. There's a good, more articulate review here Discordians may wish to take note that the 3rd song is called and sings about Eris, the Goddess of Chaos and Discord. 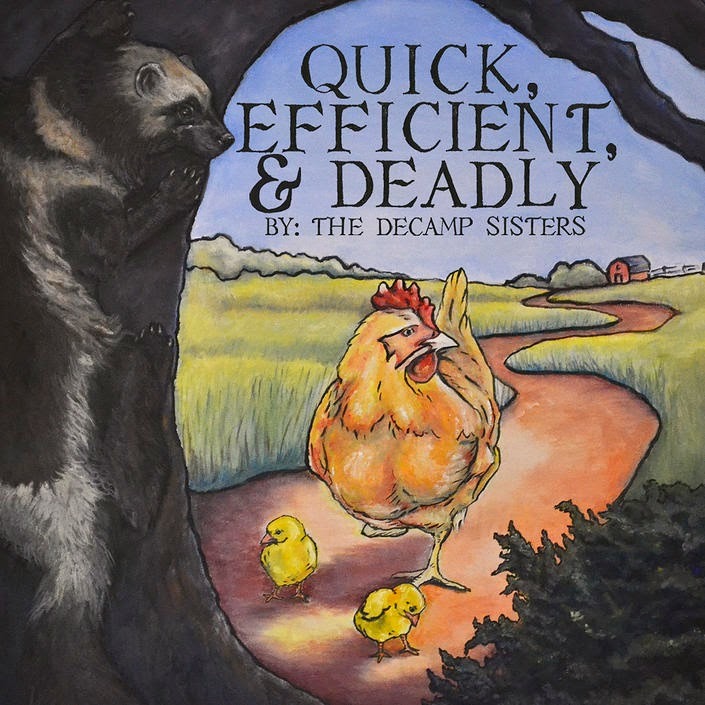 Quick, Efficient & Deadly is a new 6 song EP from The DeCamp Sisters produced by Adam Schreiber of Jack and the Bear. The music sounds folky, rootsy, a little jazz swing lope in one, a sailor's sea chanty in another, timeless like it was written 100 years ago. Some of it reminds me of old Carter Family recordings. Atmospheric with rich poetic imagery that dips deep into the collective memory. Makes me remember vague hints and traces of moods and moments from long ago - the presence of the past - useful from a bardo training perspective this music being truly quick, efficient and deadly. The Decamp Sisters are Libby and Riley. You can get a physical copy of the EP here. Or a metaphysical download here. Muscle Shoals - an excellent documentary about the Muscle Shoals sound - the recording studios and musicians and all the hit records recorded there. Great interviews with Keith Richards, Mick Jagger, Jimmy Cliff, Aretha Franklin and others about recording there. They suggest that the birth of Southern Rock happened at Muscle Shoals when Duane Allman suggested to Wilson Pickett and producer Rick Hall that they do a cover of Hey Jude. At first they thought he was crazy but it turned into a rocking southern soul standard with the combination of Allman and Pickett doing their respective things backed up by the Swampers - the original Muscle Shoals band. All the non-music segments look high aesthetic, artistic, sometimes psychedelic feeling visually capturing the musical spirit found in nature. The documentary ends with a reunion of the remaining Swampers and Rick Hall who had split up years ago. Hall produces and the Swampers play behind Alicia Keys singing Bob Dylan's song Pressing On. Dylan had cut the original version at Muscle Shoals, and the Director had a strong experience listening to it in a plane so he chose to close the documentary with it. 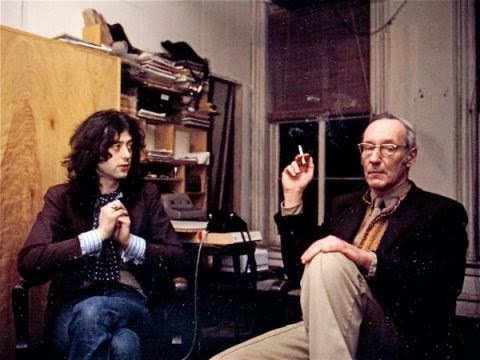 "Call Me Burroughs," Barry Miles' warts and then some biography of probably the most influential writer and literary theorist of the late 20th/early 21st Centuries, William S. Burroughs. A study of a genius, in my opinion, a complicated, sometimes tormented genius. We get in this book a transparent look at how he lived, worked, played and experimented. Thoughts, opinions, philosophies. His extensive experimentation with sound recording, audio cut ups and collages and any intended effects on the environment they might produce gets a good examination. Lots of great material. You can consider the entire interview required reading - when time permits - for anyone who claims to be a sound engineering student of mine. Do a google search for music + healing and you'll get "about 174 million results in .27 seconds", or at least that's what I got just now. Maybe it will show a different number for another search. Much information could be gained on the subject by going through those results though it might take awhile to get through all 174 million, ... or one could go to the country of Mali, located in Sub-Saharan West Africa, and get the experience of music and healing in daily practice. Except that going to Mali appears no picnic these days, especially with the rebels in the north getting rowdy and destructive from time to time - boys will be boys, you know. But soon you won't have to go there to see how music works in Mali to facilitate well-being, social harmony, and spiritual nourishment. Soon the film Music in Mali: Life is Hard, Music is Good will be out to show the world the strength and power of their music to effect positive change. Mali makes an ideal environment and testing ground for music because of the harsh conditions there. Most people in Mali live in poverty. It often ranks as one of the 3 - 5 poorest countries in the world. Of course, I speak of poverty in the common Western way as lack of material goods. In that way, Mali is poor. Not a malnutrition or starvation kind of poverty, just not a lot of basic material goods we take for granted, like stoves or air conditioning. However, the people of Mali appear quite rich in two things - spirit and music. It seems a connection exists between the two. An example of their rich spirit might be that the majority of Malians I met could see energetically, see people's auras, or their moods. A very talented kora player I know, Adama Couloubally, used to play these incredible riffs on the kora and watch with delight the effect it had as I used his music as a sort of Jacob's Ladder to get high and expand the vision. He kept trying to outdo himself and take me higher, and it usually worked. He played and I played. Life is hard in Mali. Many of our musician friends died prematurely, in their late 40's, due to toxic environmental conditions. The pollution in Bamako, Mali's capital and only major city, seems completely out of control. No infrastructure exists for handling garbage collection and disposal much less recycling. All the trash, including tons of plastic, gets taken to local dump sites, right next to where people live, and burned. Burning plastic fumes combined with the vehicular air pollution makes a toxic cocktail. Driving through downtown Bamako in the evening rush hour after my first recording session there I started hallucinating visions out of Dante's Inferno, it was so bad. I didn't know to wear some cloth over my face to filter the fumes, but learned pretty quick. I immediately passed out back in my room. The people don't have gold and diamonds, but the music can transform us into anything. You'll have to see the film to witness the sincerity of his delivery. Valuable history permeates this document especially related to the roots of Jazz and Blues. The West Africans brought their music to America when they were exported as slaves in the 17th, 18th and 19th centuries. You will hear he story about the evolution of the banjo from the n'goni - the stringed instrument griots play. The origin of the djembe, their primary hand drum, gets told. You'll see instrument makers hand crafting their products while discussing what goes into each one and how they get the best sound. As far as the roots of blues, before ever hearing this notion, I recorded Lobi Traore's acoustic album at Abdoul Doumbia's house in Bamako and as he was playing, I really got the feeling of being at the African version of the Mississippi Delta; country blues from the source a la Son House, Charley Patton, Robert Johnson or early Muddy Waters. Lobi played with the same gut-wrenching intensity, but in his own, more African, style. We cleared out the front room of Abdoul's house to make enough space for Lobi and another acoustic guitar accompanist. It was just the two of them. The sparsely decorated stone walls made the acoustics bright and lively which worked well for this instrumentation. I used both close mics and room mics, and recorded both guitars in stereo. My control area was set up just outside the door on the front porch. We started recording around 1pm. Even in the shade the heat was pretty intense, you could physically feel it beating upon your body. Not long after Lobi started playing, while the recording went down, I flashed on the similarity in mood with Delta Blues. It seemed the roots of the blues could really have come from here, but I also sensed his playing showed the influence of American Blues. Musically regenerative feedback loops across time and space. Baking in the Sub-Saharan heat, breathing in the dust, listening to an African version of Robert Johnson playing live in the next room while in full alertness recording mode, it seemed that this might be similar in flavor or mood to what John and Alan Lomax experienced on their recording expeditions into the Deep South.of the United States. There is a short clip of Lobi playing in that style in the film. You can hear samples from the album or buy the album here. It's called Lobi Traore Barra Coura. Music in Mali gives a historical overview of Mandig culture and the Mali Empire that flourished in West Africa from the time of the 13th century. It starts in that era and proceeds all the way up to the political upheavals of the last few years, the coup d'etat and hostile takeover in the north. The range of music appears equally as broad. From traditional tribal drumming and dancing- "the language of dance, the language of movement" - to a look at what might be a dj hip hop show or a rave, their version of the Electronic Dance Music scene. Popular Malian musicians are well represented, Ali Farka Touré, Salif Keita, etc. We sit in on a master kora class given by Toumani Diabate who won a Grammy in 2006 for Best Traditional World Music Album. One of my favorite sections uses a song by Nabintou Diakate, a very popular singer there, to cut in and out of narration discussing the role and difficulties of being a woman in Mali. It's a beautiful song to the Mother of Creation with the chorus plaintively expressing, "My mother, the bird is crying." We recorded her singing it beside a small waterfall on the grounds of what had once been the President's residence. More on that recording here. Not long after that comes the section on war. The war that just happened in Mali last year. After an apparently nonchalant, nonviolent, bloodless coup d'etat in Bamako, the rebels in the North took advantage of the disorganization to sieze control up there. For some ungodly reason they decided to join forces with Islamic Fundamentalists who set about doing what they do, imposing strict sharia law and being very unpleasant to anyone who disagreed with them. One musician interviewed in the film said she "left after the extremists threatened to cut out her tongue if she sang again." Later, she says that : "music will be the reconciliation of Mali." She may be right. I believe the situation has stabilized considerably since spoke. 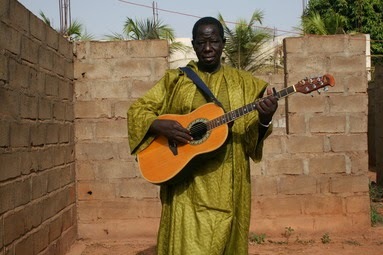 The mastermind and motivator behind Music in Mali is its director Aja Salvatore. He first began going to Mali to study its music sometime around the mid 2000s and quickly hooked up with a number of top musicians. It soon became obvious to him that they could use some help and support to get their music out there. So he formed KSK Records and learned how to record and promote them. They adopted Fela Kuti's statement, "MUSIC IS THE WEAPON OF THE FUTURE" for a motto. KSK (Kanega System Krush) describes itself as: "an independent record label, operating on a fair-trade principle, focused on the preservation and promotion of traditional music from West Africa. By bringing this music to the world market, KSK is opening new channels to an old tradition, as well as providing direct support to the carriers of this ancient knowledge." I met Aja when I recorded a jazz band he played guitar with called LSJ, their last names being Lois, Salvatore, and James. He mentioned that he liked Jali Kunda, Griots of West Africa and Beyond, a griot music travelogue that I had recorded with Bill Laswell and Foday Musa Suso. Not long after, Aja asked me to show him and his brother Eo how to operate Pro Tools along with some basic micing techniques in preparation for their first recording expedition to Mali. We mixed those recordings at Prairie Sun and they became the first KSK releases. The following year Aja expanded his recording set up and brought me to Mali to engineer. The music recording naturally evolved into a film project. Industry professionals were brought on board such as Producer/Director of Photography/Editor David Nicholson. Like a good anthropologist, Aja completely immersed himself in West African culture becoming fluent in Bamana, the local language while also learning and participating in many of the local traditions. He tells their story from the inside, not as a musical tourist. Actually, most of the time he encourages the musicians and locals to tell their own stories in their own words. Salvatore's success gets measured not only by the worldwide attention he's brought to his artists, but also by the great respect those same artists hold for him. Kanega System Krush is doing African music right! For 8 years they've been visiting Mali - one of the richest musical nations in the world - and not just meeting the known stars, but really listening and exploring. The artists KSK has recorded and filmed are exceptional sincere, authentic, and absolutely worthy of global attention. Some are known to an extent, others not at all, but this is not about celebrity. It's about the quality, power and emotional impact of the music. I am a fan of the releases and supporter of the spirit in which they have been made. Opening scene: night in Bamako, close-up of a woman with a child on her back wrapped in a blanket cuts to a high energy concert shot, Samba Diallo and band, still night time, outdoors in Bamako, concrete ampitheater, flags and emblems signifying cooperation painted on the back wall alongside Keith Haring-like characters. "Drum and dance are like history books " Village life ... fishing the river with long low dugout boats. Once it's been heard, it's for the whole world"
Beautiful black eyes. 1/3rd of it's population sold into slavery. Secret of weaving. Hunting reenactments, buffalo evoked with masks and costume in dance and drumming. Blacksmiths made the first djembe inspired by the rhythm of pounding millet . The spirit music of Timbuktu. Fires burning in the bush by the side of the road. "There are forces that make things happen. We are here to save the past. I am a Griot." Village music, one string violin riffs and melodies by the river in 110 degree heat.